If you are aging gracefully and still want to stay in style, then do not stop the natural growth of grey hair. In the recent days going grey is not anything to feel embarrassed about. Instead of this embrace your grey hair and make it your fashion statement. 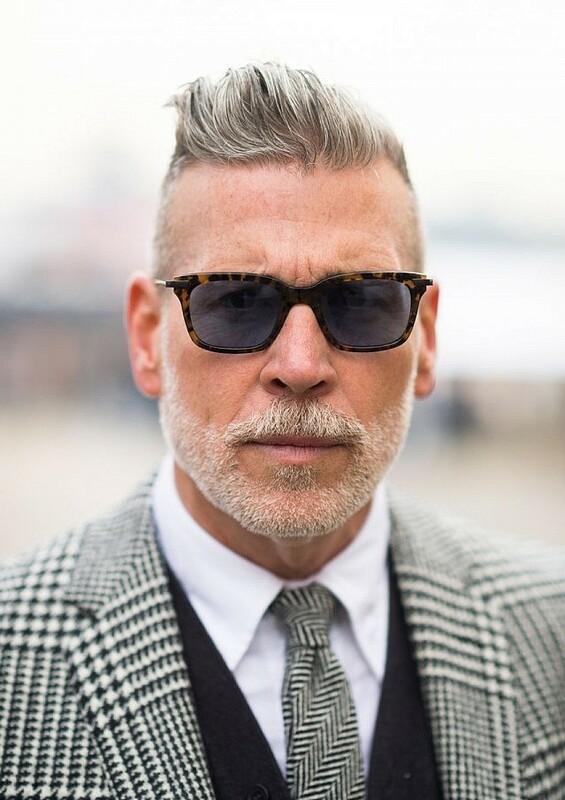 If you can get a proper hairstyle according to your face shape or hair volume, then grey hair is the coolest thing that happened to you ever. If you cannot believe this fact, just check out the young guys who are in love with the grey color and dyeing their hair with it to flaunt the stylish and smart look. 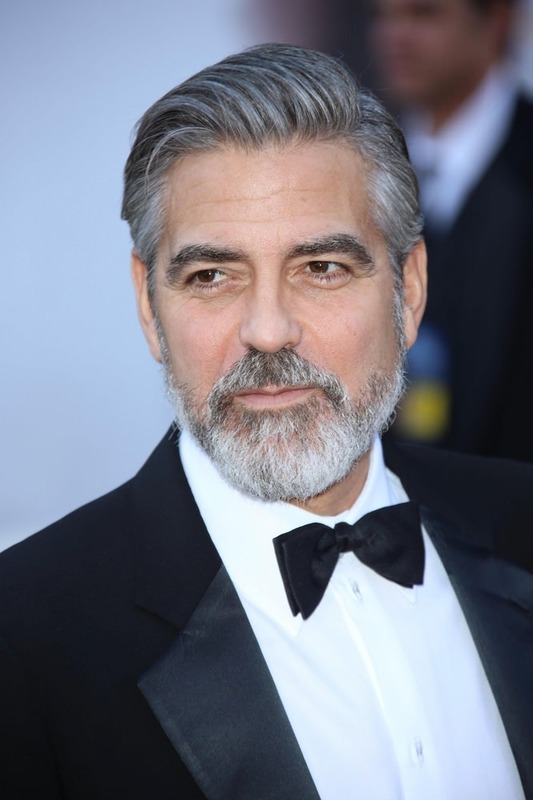 In fact, some stunning hairstyles for men with grey hair can shave off some years from a guy’s real age. It surely makes them look youthful and young what he feels from the bottom of the heart. So, it is the time to pick up the best one for you from the list of these trendiest Grey Hairstyles for Men. If you are in love with the rough and tough look, then you can try this look for once. To get this look at first, you have to get the undercut hairstyle. After this, you will get shaved side part of the top part full hair. Take a sleeked toothed comb and sweep it towards the back. If your age is not stopping to take steps, then you put up some new hairstyles to look younger forever. If you want to wear this hairstyle then, shave both of the sides of your head properly. After that, take all the hair of the top portion and make a stunning pompadour with the help of comb and hair setting spray. The oldies, who love to stay extremely simple in terms of look and attire but want to get an attractive appearance, can have this hairstyle. If you are willing to get this hairstyle then just make a side parting and comb it properly. 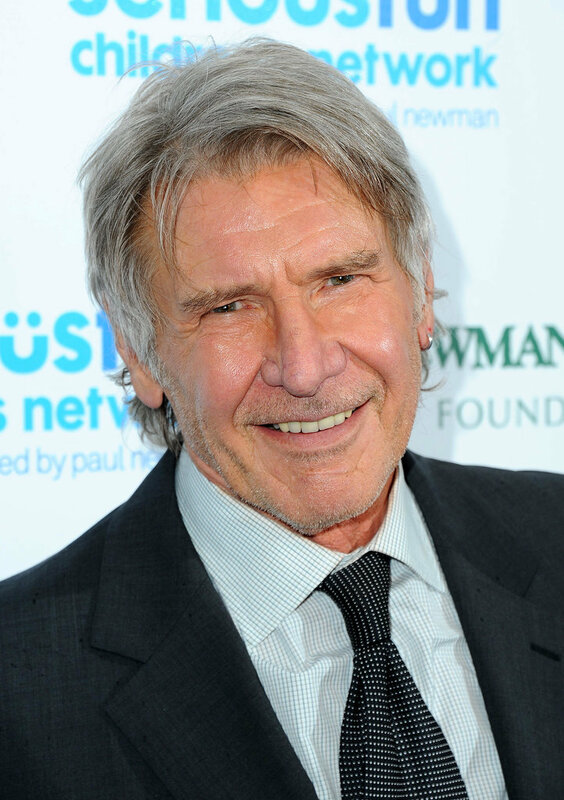 Many middle-aged men love to keep gray hair from getting a wise look. If you are on that list, then this hairstyle is for you. For having this hairstyle at the very first, you have to make a mid-side parting. Comb your hair lightly and leave them to get a messy look. Men of any age can wear this look. If one can carry this look properly, they will surely draw everyone’s attention at a glance. If you want to get this hairstyle, make the double side parting. Comb properly the hair of both the sides. With the hair of middle and top portion make spikes and get a stunning spiky look. If you are an oldie but still want to get a glamorous look, then try this hairstyle. For wearing this hairstyle, you do not need to spend a lot of money or time. At first, make a side parting and sweep your hair aside. Use any hair setting spray to hold the look. The men who mostly prefer to stay neat, clean and free they must try this hairstyle for a change. To get this hairstyle at first, you have to trim your hair in a very short length. Only some string of hair will be long in the front. Sweep then perfectly with a comb and set the look using any spray. 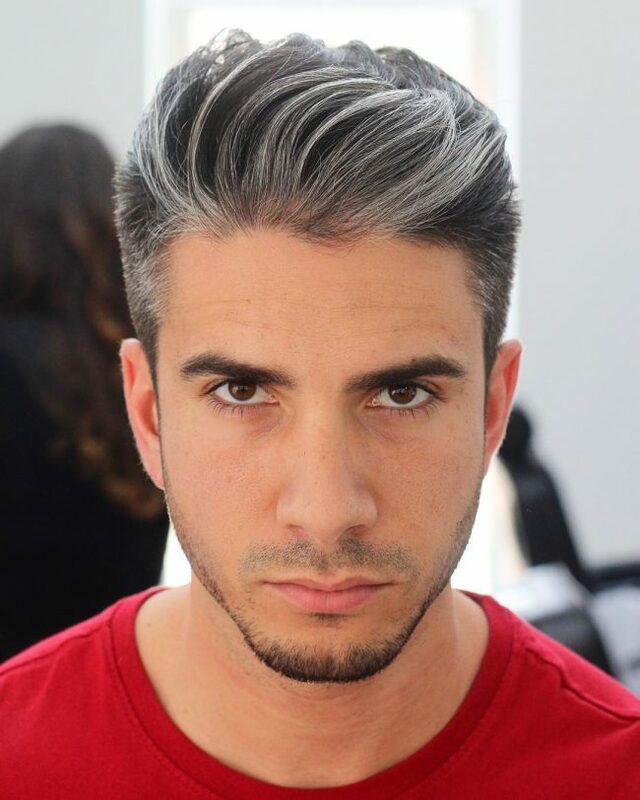 This style will look the best for the young or mid-aged guy who loves to dye their hair with grey. To get this hairstyle in the beginning just chop off the hair of both the sides. After that with the hair of front part make a quiff and by using any pomade hold this look perfectly. Men of any age can wear this look to create a sensation. When you wish to get this hairstyle, remember, that your hair color must be grey or silver in this case. Because it looks best on that only. In this hairstyle both the sides will be perfectly trimmed. Only the top and the front part will have long hair. With that, you can make the tapered wave at the front. There are a lot of men in the world who love to keep long hair still in the old age. If you also have a soft corner for this then try this hairstyle for once. To get this hairstyle, you must have long and curly hair. Just comb them perfectly to bring the best out of this look. 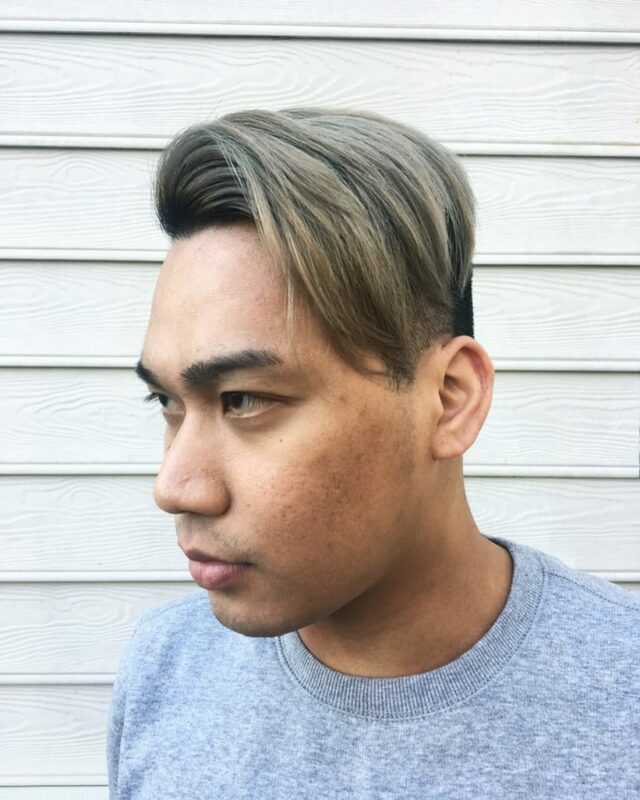 This skin faded hairstyle will be appropriate for the young aged guys with grey hair. Even oldies can also have this if they can carry it properly. In this hairstyle both the sides will be faded in some layers. Only the top portion will have long hair. You can give your hair a spiky look with the help of any pomade. If you truly love some outstanding hairstyle with grey hair, then this hairstyle can be tried once. To have this hairstyle, you must have thick and well amount of hair. This is a very easy to wear hairstyle. You do not have to spend a lot of money or time to get this hairstyle. Just make a side partition and comb your hair aside for the best result. This particular hairstyle is absolutely perfect for the old men who want to look classy and glamorous at the same time. If you also want to have it, sweep all the hair towards the back. Only the hair of front part can be spiked to add some points to the look. 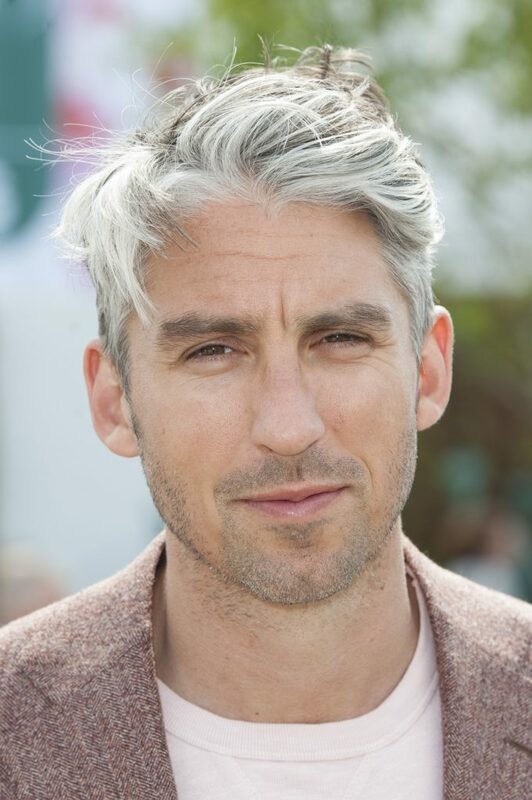 Some men want to look bold and hot along with grey hair. For those, this hairstyle is absolutely perfect. If you desire to have this, shave both of the sides at first. After that, with all the hair on top part make a high quiff. Use any pomade to hold the hairstyle perfectly. You can also keep a little amount of beard with this look. Korean hairstyle never fails to impress other whether you are young or oldie. If you also have immense love fir, this hairstyle asks your barber to chop it with some medium bangs. Make a side partition and sweep them asides. Keep some fringes at the front to enhance the beauty of this stunning look. This is one of those hairstyles where you do not have to spend a lot of money or time to get the hairstyle to the exact. For wearing, this look makes a mid-side partition in your hair and combs it nicely. You can use any hair gel to set the flyways. There are so many people who are aging gracefully but suffering from receding hairline. Still, they want to get a glamorous and attractive look. For those, this hairstyle can be an appropriate one. To get this hairstyle sweep all the hair towards the back. Keep some little hair in the front to hide the receding hairline like magic. This hairstyle is no doubt a very attractive one to draw everyone’s attraction. If you want to get, this hairstyle makes a side partition. After that, sweep them at the sides. To bring the best out of this look, you can get some highlight on your hair with grey or silver color. This hairstyle is most appropriate for the young guys or the middle-aged men. If you want to get this particular hairstyle, make them grow longer. In this hairstyle, both the sides and back side will have the shortest hair. The top and front part will have longer hair. It will give you an edgy look with long bangs. This hairstyle is absolutely different from the others on this list. In this hairstyle both the sides will be faded and trimmed with the razor. The middle part of hair will be slick brushed towards the back. This slick back with undercut hairstyle will get countless compliments along with a beard and mustache. If you are aging with full grace and want to stay in style perfectly, then this hairstyle is absolutely approach for them. If you want to put on this hairstyle, then shave off both the sides. With all the hair of middle part make pompadour on the top. If you want to bring the best from this look then, keep a full beard with this. This hairstyle is extremely bold and provides hot look. To get this hairstyle, you have to make a side parting. Sweep all the hair of smaller part aside. Take the hair of top portion and make a small quiff or apply the spiky style. The rest of the hair will be brushed towards back with a slick toothed comb. So, all you need is select a great style from the good Grey Hairstyles for Men like slick back undercut or classic side part and many more. Except these, you can also keep some locks and be sure that it will make you appear trendy instead of old.